When I started working here at Lark, just three weeks ago, I was delighted to note on my first day that there is a Sonos speaker pride of place above the fireplace. Yes, there’s a fireplace! It’s a really lovely office. I’m used to writing with music playing - aggressive German techno in my headphones, more often than not - and I find that a little communal music in a shared work space is always a joy. For me, at least. But this being Lark, there’s no straight-up Sonos listening. We don’t simply press play on a predefined playlist and let algorithms do the work. We’re creatives! And so the rules here are that we must build playlists in themes. So, one day the theme might be ‘Eggs’, and we then have to compile a list of songs that are about eggs. There are very few, by the way. That playlist wasn’t the strongest. Last week we thought up an absolute corker - ‘One Word Commands’. If there’s half an opportunity to shoehorn Cher’s ‘Believe’ onto a playlist, I will grasp it with both hands. ‘One Word Commands’ also featured ‘Jump’ by Van Halen, ‘Shout’ by Lulu, and ‘Salute’ by Little Mix, which - I would learn from Sophie - is the official Lark office anthem, an assertion that was then hotly contested by Paul. I am no closer to the truth. The only truth is that Salute is a 10/10 banger. The TL;DR here is that this playlist theming got me thinking of songs that reference great literature, and this being a blog about all things wordy (and beyond), I thought this might be a good place to share said thoughts. After much research - listening to Kate Bush - here are the best retellings of literature in music, a list that is completely objective. Do not @ me. The whole Pink Floyd album ‘Animals’ draws inspiration from George Orwell’s 1984, and is a scathing critique of capitalism. We’re sure Orwell would approve. I kind of spoilered this one already, although I could have chosen a number of songs by Kate. Like the one she based on the old traditional English-Scottish song ‘Lucy Wan’ (The Kick Inside), where she sings the suicide note of the young woman pregnant by her brother - spicy! Or The Sensual World, inspired by Ulysses by James Joyce, perhaps. Wuthering Heights, based on Emily Bronte’s love story, is an obvious choice - but one that shouldn’t be overlooked. Best enjoyed with rain pattering against the windowpanes and an oversized woolly cardigan. 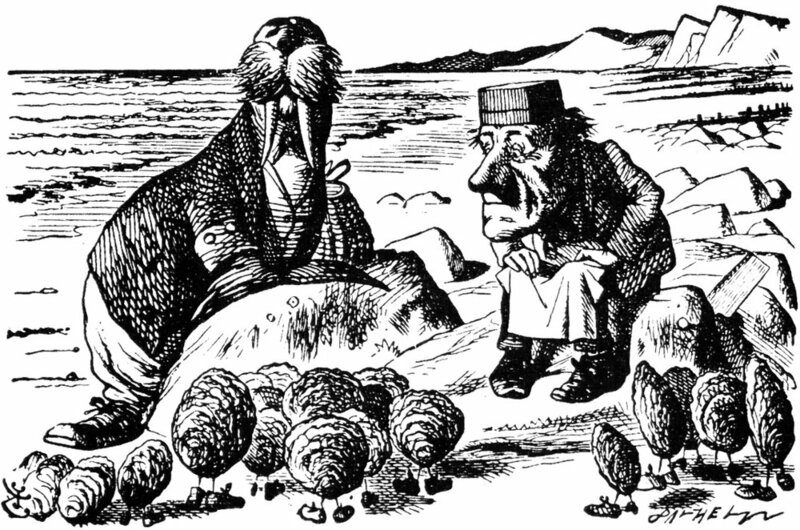 Amongst the goo goo g'joobs, crabalocker fishwifes and pornographic priestesses, John Lennon paid creative debt to Lewis Carroll - the titular walrus being based on the character from Alice Through the Looking Glass - as well as drawing inspiration from nursery rhymes like ‘Three Blind Mice’ (“See how they run like pigs from a gun...see how they fly”). I Am The Walrus may sound like a mad acid trip made reality, but there’s a lot of literary magic happening under the surface. I’m not even joking! This 1987 classic’s lyrics are about Mary Shelley’s Frankenstein! This is a bit of a cheat entry as most of the references were cut for the single version (lord knows why), but it’s going on the list nonetheless. Who knew Carol Decker was such a fan of the 1818 gothic novel? Best enjoyed whilst wielding a large can of hairspray. So there we have it! There are countless other excellent songs that quote literary greats - tweet us your favourite at @larkingly. We might even make a playlist of them.